In the volume by Carlo Morbio, France and Italy (1), we find information on a large exhibition that the Brera Academy presented to the public in 1872, consisting of Milanese paintings, ceramics, sculptures, miniatures and more. This was an exhibition that had a vast European reverberation, so much so that. as the author writes, "Milanese and foreign newspapers spoke about it widely" (2). Since Morbio was particularly interested in miniatures, after describing the many works present, to our surprise there comes to be illustrated a section of the exhibition featuring very old tarot cards, probably the first ever exhibition in which tarots were presented to the public. In the room dedicated to the Tarot, the two owners who lent the decks exhibited, i.e. Duke Uberto Visconti and Cavaliere G. B. Brambilla, are indicated. "Duke Uberto Visconti and Cavaliere G. B. Brambilla. To these gentlemen are due the cards of Tarocco, painted by Marziano da Tortona, for the young Duke of Milan, Filippo Maria Visconti, which would indeed be among the most beautiful gems of the Exposition, had they not been almost all marred by an ignorant restorer, as we shall see. In my other work, that is, Opere Storico Numismatiche [Numismatic Historical Works] (Bologna, Romagnoli, 1870), I spoke at length about playing cards, their origin and etymology, the main known packs of cards, etc. ; and coming to the aforementioned details, we noted that Decembrio, in the life of that Duke, wrote that Marziano da Tortona had as the prize for his Work, the sum, huge for that time, of 1500 gold florins. Shortly afterwards, i.e. in 1484, the painter Antonio da Cicognara flourished in Lombardy, who, according to the Chronicler Bordigallo, with a subtle magisterium, illuminated a magnificent pack of Tarocco Cards for Cardinal Sforza and his sisters, Augustinian nuns in Cremona. This Cicognara also illuminated the beautiful Chorales of the Cathedral of that city”. Luna e stelle cessar dal loro uffizio. Diè morte a sua virtù, cangiata in vizio. E la giustizia ebbe il trionfo (1) a sdegno. Un Papa, oh! giorno critico e infelice! Per far Papessa poi l'Imperatrice. Ma chi gli crede, affè ch'egli è un gran matto. Moon and stars ceasing from their office. Came to the death of its own virtue, changed to a vice. And justice had the triumph (1) in contempt. A Pope, oh! Critical and unhappy day! To make the Empress then Popess. After this literary parenthesis, Morbio continues the description of what he observed in the exhibition illustrating the cards belonging to Duke Uberto Visconti (4). "They are laid out in a modest and dull black frame, with golden crowns, just like in mortuary tombstones, 67 (and not 77, as the Catalog says in the 1st edition; an error corrected later) cards belonging to Duke Uberto Visconti, of which 28 are depicted on a gold or silver background, partly refreshed, but in too shiny a tone. Of significance are: the Universal Judgment, with the legend Surgite at Judicium; a figure armed with a sword, and having at her feet a woman with blue mantle, bearing the legend: Halmente (? ); that alludes to the marriage of the young Duke with the already mature Beatrice Tenda. Love, with blindfolded eyes, directs two burning darts at the bride and groom near the thalamus [a part of the brain]; nor did the painter forget the dog, a symbol of that fidelity which was soon forgotten by the ruthless and inconsistent Duke; a scene with landscape, rider, and riverboat; the Emperor; the horse of death. This is the best part of the deck" (5). From top to bottom and from left to right the cards described above by Morbio: The Judgment, The Queen of Swords, Love (The Lovers), The World, The Emperor, Death (6). "Other cards, worked by the same artist for Duke Filippo Maria Visconti, were exhibited by Sig. Brambilla. They are less valuable and important than the ones described. They add up to 48, of which only nine are figured; among the best we noticed: Fortune; The Emperor, etc. The Brambilla Cards are arranged with a certain splendor of turtleshell and bronze (Boule), and with sumptuous inscription, in capitals, and showers of glittering, red and green talc, etc. in all the colors of the rainbow. The coins are depicted by the same gold florins, as in the others of Duke Visconti, but equally enlarged. The signs that floated around the poles, goods, etc., must have had certain Legends or Devices, as are seen in some of the cards, for example, in that with: Phote mante (?) - A bon droit. This legend is also seen on Duke Filippo Maria Visconti's cap. In another card as well: A bon droit. In other cards, but principally in that with the Biscia Viscontea [Visconti Viper], and the bows, clearly the legends across were canceled by the incompetent restorer, who, without knowing them or deciphering or reproducing them correctly, erased them, or transcribed them incorrectly. Some of those legends did not mean anything, so they had to be marked with ?. ... All these cards, then, are indistinguishably presented in the awkward concave [i.e. curled up] form of [roof] tiles. 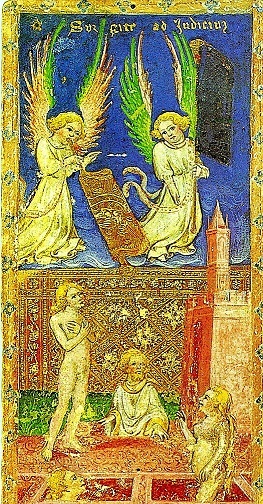 A learned Milanese journalist, in the account in the Exposition in Arte Antica [Antique Art], deploring the painful restorations, finds in these figures of Marziano da Tortona: "It evokes the work of Benozzo Gozzoli, and a little of that serene aura, making the Angels joyful, of the folds [of the gowns] of Fr. Angelico da Fiesole .... They have the style of the famous Troso of the Zavattari, who painted the Teodolinda Chapel in the Cathedral of Monza; and of which cannot be appreciated enough the gentle elegance of the movements, and the rare power of expression" (8). Below are some of the Brambilla Tarots as described by Morbio. From top to bottom and from left to right of the reader can be seen: The Wheel of Fortune, The Emperor, The Seven of Cons and the Ace of Batons with the inscription A bon droyt (By good right) (9). 2 - Ibid, p. 225. 5 - This is the tarot known as the Visconti di Modrone pack, now at the Yale University Library. The cards were probably exported during the last World War or shortly thereafter. Some documents of the Superintendency speak of a dispute between the State and the Visconti, which was closed with a 'balance sheet' offer (State Attorney's Letter to the Minister and for reference to the Superintendence of 19 August 1950, protocol 860). In 1947 they were bought by B. Cary Jr. who later offered them to the Yale Library. See: Il mazzo Visconti di Modrone, in Sandrina Bandera (ed. ), Brera. I Tarocchi. Il caso e la fortuna. Bonifacio Bembo e la cultura cortese tardogotica [The Tarot: chance and luck. Bonifacio Bembo and late Gothic courtly culture], catalog of the exhibition installed in 1999 at the Accademia di Brera, p. 52. The pack, incomplete, is currently composed of sixty-seven cards: 11 Triumphs (Major Arcanas); 17 court cards and 39 number cards. 6 - Facsimile reproductions of the cards produced by U.S. Game Systems in 1984. The cards have been lightened slightly by us to better bring out the details. 7 - Purchased by Brambilla in Venice around the year 1900, the 48 cards that make up the pack, whose attribution to Bonifacio Bembo is not fully shared by art historians, were purchased by the Italian State in 1971 and assigned to the Brera Academy. 8 - Carlo Morbio, op. cit., pp. 233-234. 9 - Cards reproduced from Bandera, op cit. (note 5), pp. 28, 32, 50.Also in this case they are slightly lightened to bring out the details.